When I was invited to do a few promotional events for my book in Bergen, I welcomed the opportunity. This meant some hours in a shopping mall signing books, but also taking part in a beer tasting with an additional opportunity for book sales. 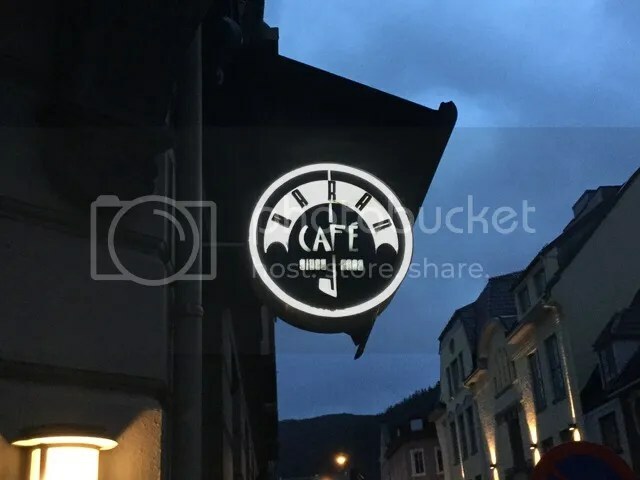 Arriving at Bergen airport, I was picked up by Sammy, who kindly drove me to my first stop, the Gulating beer shop, located in a shopping mall some distance from the city center. But we made a short detour, allowing me a brief visit to 7 Fjell, one of the craft breweries being successful, also on a national scale. No price for the scenery, they are located on a no nonsense industrial estate, but the beer they brew is impeccable. They are taking over a larger slice of the building than they are using today, so there will be a tasting room and other facilities in the future. Helge gave me the ten minute tour. 7 Fjell is doing very well, right now the fermentation tanks are the bottlenecks of the brewing. Onwards to Gulating, where I spent three hours signing books. Not a huge success, but a trickle of customers. The shop, however, sold a respectable amount of beer while I was there. 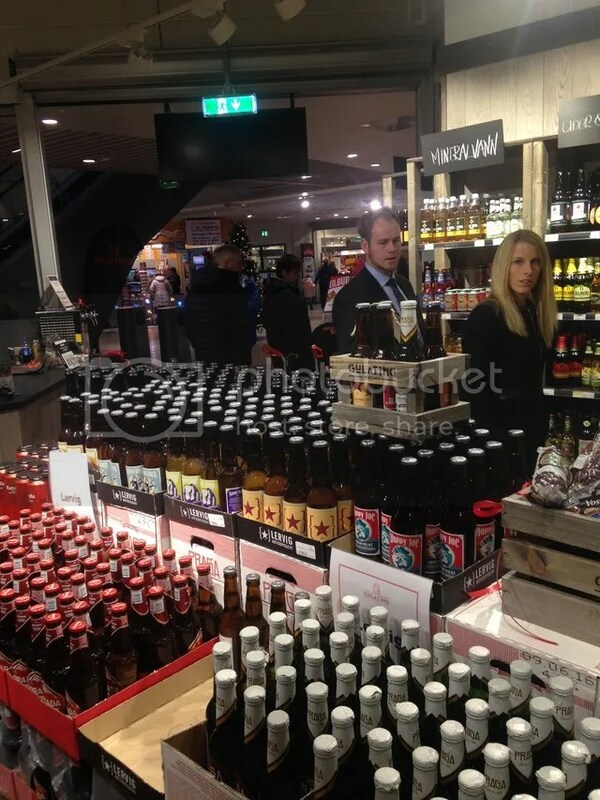 The emergence of at first good beer shelves in Norwegian supermarkets and then specialist beer shops selling beers below the legal limit of 4.7% is way beyond what I had expected a few years ago. The Gulating shops buy their beers directly from the breweries, meaning they can offer lower prices to the customer than supermarkets. They also have a great range of beers from the smallest breweries, which are hard to find without extensive travelling. A quick check in at my hotel before arrival at UNA bar and restaurant, where I was invited to present my book at a tasting of vintage Christmas beers. This was hosted by Stefan, who has a good routine of doing events like this, I tried to add my bit to the proceedings. UNA is the place with the most impressive tap list in Bergen, of particular interest when I visited was that they had a home brew on tap. 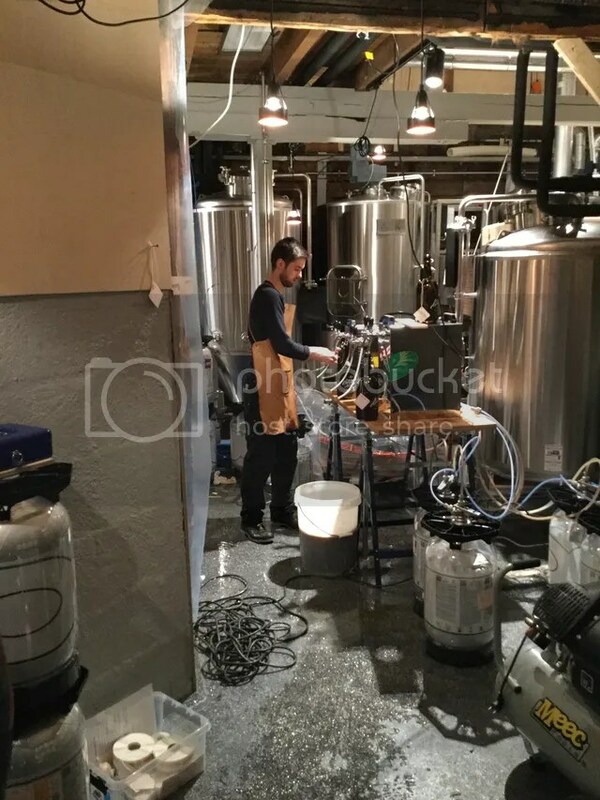 They have their own brewing permit, but so far they just have a tiny setup in the basement. Their first beer is a Light Stout – as opposed to a Dark Stout. Highly drinkable with some coffee and cocoa notes, slightly sweet. Brewed to have a broad appeal, and there is nothing wrong with that. Across the street to the next brewpub, Bryggeriet, a part of the huge bar/restaurant complex Zachariasbryggen. I was visiting briefly this summer, with a serious case of bad timing, it was a week before the first beers were due to be released, and none of them were ready. I had better luck this time, even finding brewer Gareth behind the bar and ready for a chat. The original idea was to have a range of four fairly standard regular beers, this has evolved into six of their own beers on tap most of the time, and a wish to be more playful. I sampled Snøwit, a fairly strong wit, which I enjoyed, particularly since it was low on the coriander scale. 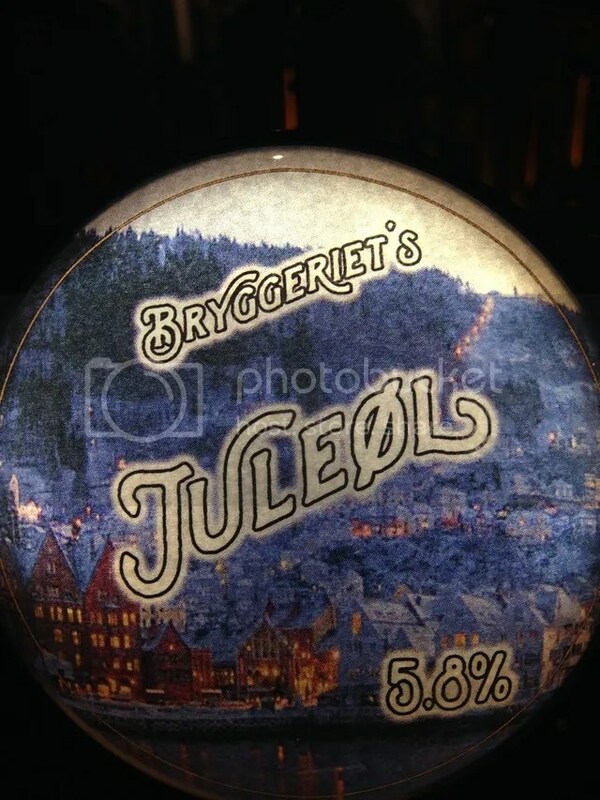 Their Juleøl is a spiced porter. My favourite was the Flagship IPA -a great allrounder that would work well both with food and as refreshment. Grass, citrus and discreet maltiness. My last stop was the third brewpub, Baran Café, where I had a nice chat with Ali. 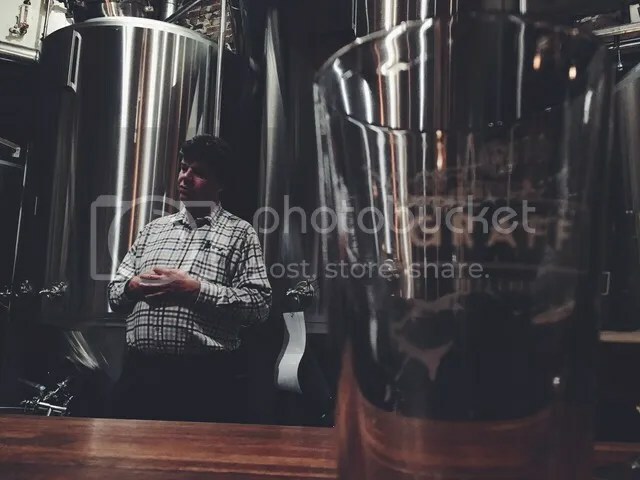 Well, technically it is not a brewpub, since the brewing is done elsewhere, but he brews his own beer and sells it in his café. I had a beer, but I’m afraid there are no notes from its consumption. It is a quiet place to hang out, make sure you visit if you are in town. These rambling notes do not do justice to the Bergen beer scene, but I hope it might inspire tickers and drinkers to make a visit. Bergen has established itself firmly on the Norwegian beer map. Note: The trip was paid by my publisher, and I did not receive any compensation from the establishments mentioned apart from some beer samples. Life in a city bordering on the icy northern ocean can be tough. A main street with a brewery at each end makes things more cheerful. It’s not pitch dark in Tromsø during the last days of November. But when my plane lands slightly after noon, it is already dusk. The cold winds from the Arctic bring sleet and snow. The sensible locals wear sturdy boots with spices to navigate the icy pavements. –I suspect most shops and restaurants will have to replace their flooring every spring. There is a crunchy sound when the metal spikes meet the parquet floor. Tromsø used to be the last outpost of civilization. A base for the trappers and explorers, traders in timer, pelts and fish. Now it is a sizeable town – for Norway – with a fair number of hotels. The locals are fond of the nickname The Paris of the North. Among the attractions of today, there is a brewery at both ends of the main street, Storgata. One is a reborn old-timer, the other is spanking new. Mack is the established one, with a history going back to 1877. As with many in the industry, the inner city location became too cramped, so they moved the main brewery out of town a few years ago. At the same time, they established a micro-brewery in the historical building, well integrated with a bottle/souvenir shop and next to the traditional beer hall. 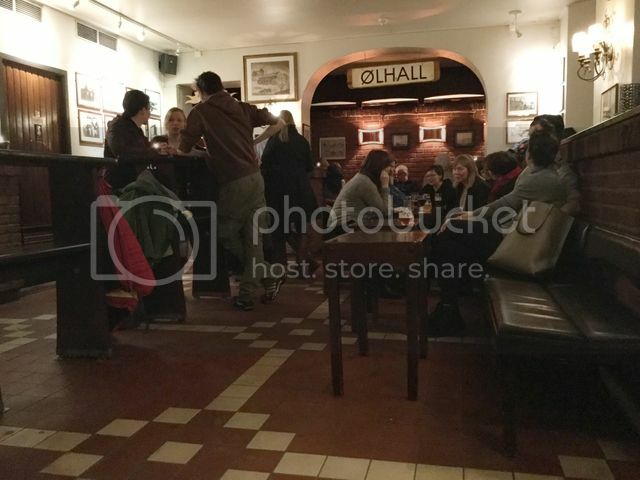 The beer hall – Ølhallen – is a story in itself. This was the brewery tap, open only during the daytime. This was not for recreational drinking for the chattering classes, rather a place where seal hunters, fishermen and explorers came when they went ashore, rubbing shoulders with locals who took their noontime pint seriously. The interior is still like in a time warp, with a stuffed polar beer greeting you at the entrance. The floor is tiled, easy to hose down at the end of the day. There are still a number of tables for drinking standing up. But they have put in more comfortable seating. The clientele dropping in on a Friday at the end of the office week seem to be office workers and academians, no sign of knitted pullovers and sou’westers today. And the beer range is fantastic. The full range of Mack beers, obviously. But, in addition, fifty taps of Norwegian micro brews. 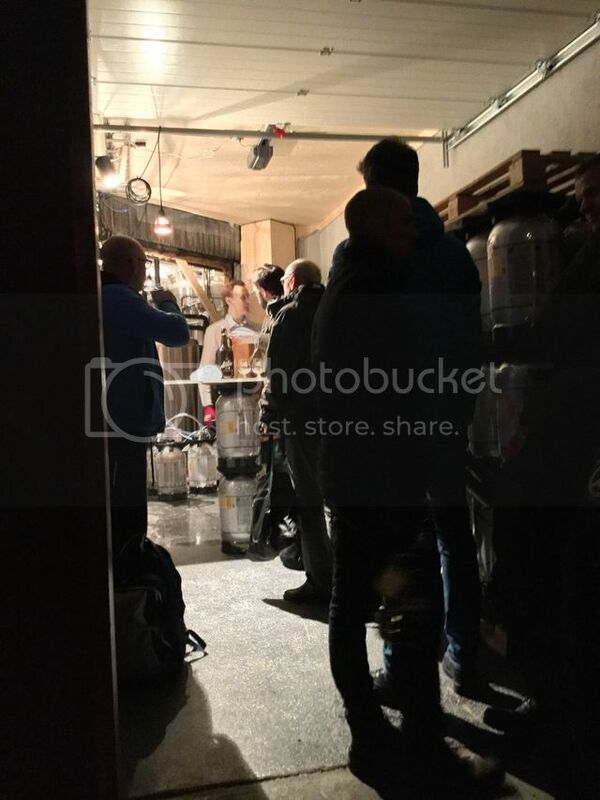 Five from their own micro, the rest from Røros, Lervig, St Hallvard, Austmann, 7 Fjell, Nøgne Ø, Kinn, Ægir, Amundsen, Voss, Grünerløkka Brygghus – and local newcomers Graff Brygghus, more about them shortly. This is one of the best tap lists in Norway, I sincerely hope they have a turnover that is good enough to keep this going. I limit myself to a glass of the saison brewed in-house. True to type, a beer properly characterized by the yeast, and where the hops and malt are firmly but politely pushed into the background. Ølhallen is filling up as I leave, most of the locals seem to go for the Mack Christmas beer. My reason for visiting Tromsø is the other brewery, Graff Brygghus. They launched their first beers just a few weeks ago, but they have been very well received. 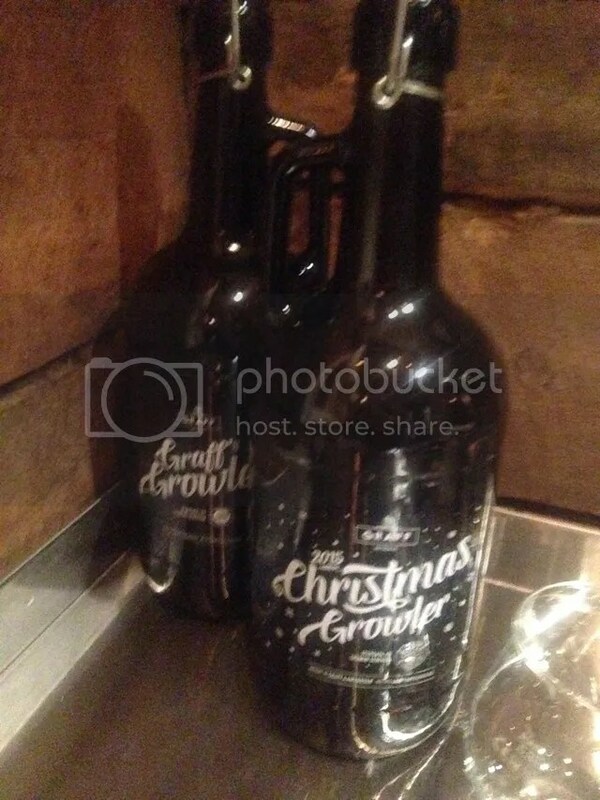 They did not have their bottling line set up when I visited, but they have a good alternative – selling growlers. When I walked by, there were 15 persons patiently waiting in line to fill up their two liter glass kegs. They filled 150 kegs on a Friday afternoon, most of them with new glassware. They have four of their own beers available, and from what I observed, the customers come back to try them all. This is a way of distributing beer which is fairly well spread in North America, in Norway there are just a few others – Lindheim, Voss and Northern are the ones I know of. It is a good way to get your beers out of the brewery and into peoples’ homes – but they also make great gifts and, most important, they make people talk about the brewery. I come back a few hours later, when there is a pub night at the brewery with yours truly invited to talk about my book and do some signing. I was very happy to get an invite from Graff, as they were one of the spanking new breweries included in the book. In fact they were not actually brewing when the book went to print – but I took the chance to give them a two page spread. 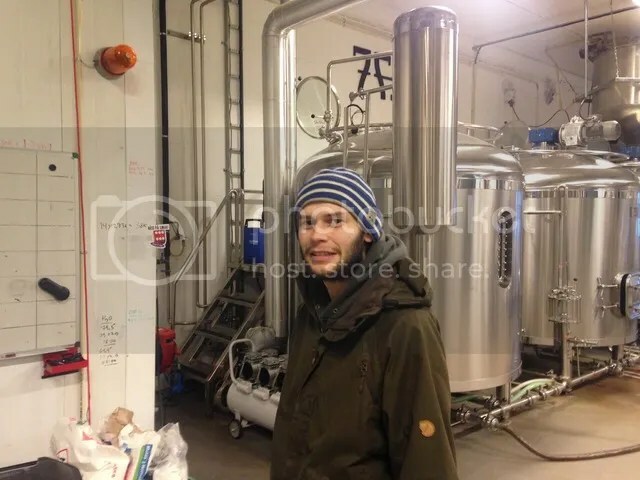 Graff Brygghus is run by two young men, Martin Amundsen and Marius Graff. Marius is barely in his twenties, but he has won homebrewing competitions well before he was of legal drinking age. They have set up their brewery in an old wooden house that has been used for various workshops for a century or so. Into this they have set up brand new brewing equipment from Portland Kettleworks. The beers get their inspiration from the US West Coast, too, hop forward brews without going to extremes. My favourites of the evening were a grapefruity red ale and the seasonal Advent, brewed with just the right amount for rye malt. These two guys really impressed me. They have attention to detail, they have the technological know-how – and they brew great beers from batch number one. While some of the founders of the Norwegian craft beer movement may be stepping down, there are new ones ready to fill their shoes. I think I have seen the future of Norwegian brewing. His name is Marius Graff. Remember I told you so when his beers turn up in Stockholm, Berlin or London.